Click on Start or the Windows orb logo on the taskbar at the bottom of the desktop to show the Start menu. Click on Programs or All Programs to show a menu of installed programs in Windows. Click on the Accessories folder to expand it. Click on the Notepad icon to open the program. 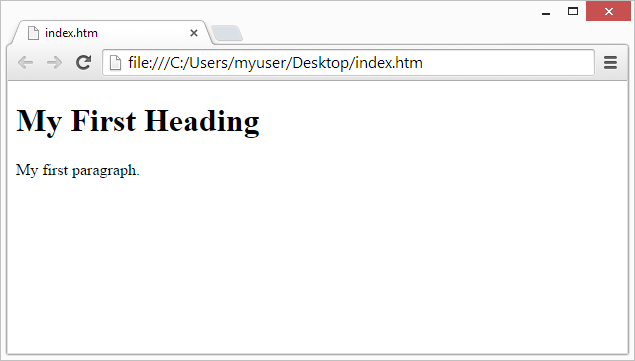 Name the file "index.html / index.htm" and set the encoding to UTF-8 (which is the preferred encoding for HTML files). How to type html? how to modify html files? easy to learn Write HTML Using Notepad or TextEdit Web pages can be created and modified by using professional HTML editors. However, for learning HTML we recommend a simple text editor like Notepad (PC) or TextEdit (Mac). We believe using a simple text editor is a good way to learn HTML. Follow the four steps below to create your first web page with Notepad or TextEdit. Step 1: Open Notepad (PC) Windows 8 or later: Open the Start Screen (the window symbol at the bottom left on your screen). Type Notepad. Windows 7 or earlier: Click on Start or the Windows orb logo on the taskbar at the bottom of the desktop to show the Start menu. Click on Programs or All Programs to show a menu of installed programs in Windows. Click on the Accessories folder to expand it. Click on the Notepad icon to open the program. Open Start > Programs > Accessories > Notepad Step 1: Open TextEdit (Mac) Open Finder > Applications > TextEdit Also change some preferences to get the application to save files correctly. In Preferences > Format > choose "Plain Text" Then under "Open and Save", check the box that says "Display HTML files as HTML code instead of formatted text". Then open a new document to place the code. 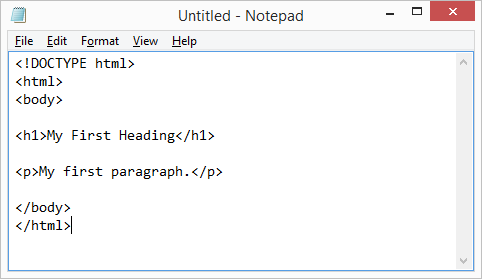 Step 2: Write Some HTML Write or copy some HTML into Notepad.